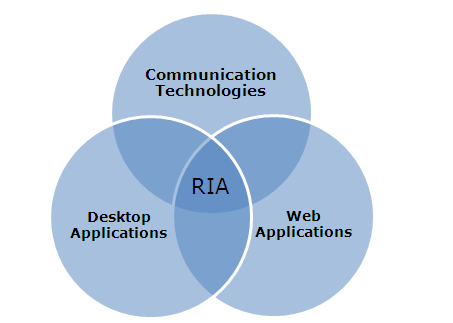 RIA - Rich Internet Application is a web application form (web application) try to show the traditional functions of the software running on the desktop. At any rate, the RIA erase non-state theory of the HTTP protocol. What is feature of RIA? RIA applications run entirely on the browser (web browser) supports Flash without having to install the application. Download capacity is large, so it depend on network. Not friendly to search engines. What is advantage of RIA? Don't need to install or deploy, simple as running Flash applications. User interface is very impressive with attractive effects. Interactive asynchronous (Asynchronous communication) with the server, reducing the use of network resources, as well as savings of server activity. Besides, easy to move data between client / server without requiring users to manipulate multiple and continuous. How to build a RIA application? Simply and easiest way: you can find and download the books on the topic & tools to learn more. If you wonder between flex & silverlight then you should learn which one? In a story with a friend a few days ago, we talked about Flash is installed on most (> 90%) current web browser, while the silverlight only ~ 6.3% is set on the number of . That means you learn flex will have a better future, you think so, right? But that day my friend ask me back an issue, if the default install Microsoft Silverlight on all versions of IE in the upcoming version of Windows, install silverlight browser market share will increase to what extent? Perhaps at about> 80% as the market share of IE today.